This project would be great with a circus themed room or even a Princess themed room. First, find the center of your ceiling. This can be done quite easily by drawing a line from one corner of the room to the opposite corner of the room. You can do this by snapping a chalk line from corner to corner. Then do that again from the opposite two corners – where they intersect is the center of the room. Mark it securely with a nail. Second, draw a circle on a piece of cardboard and cut that in half and use that as a template. (You could also use a large paper plate or simply draw around something like a large circular serving plate. The bigger the circle the less work this will be in the long run.) Take the half circle template and place it flat against the wall at a corner with the straight side up against the ceiling. Trace around the template to create your first “scallop” on the wall. Slide the template over, keeping the flat edge against the ceiling just until the you pass the first “scallop” and trace around the template again. Make sure the edges of the scallops touch slightly. Repeat this around the room on all sides of the room. Third. Once you have all of the “scallops” drawn on the wall at the ceiling line, draw a line from the center of the room to the point where each scallop touches the next scallop. Continue this all around the room. If you have a chalk line – attach it to the nail in the center of the ceiling and snap a line at each scallop. Now you will have lots of thin “pie shaped wedges” on the ceiling. 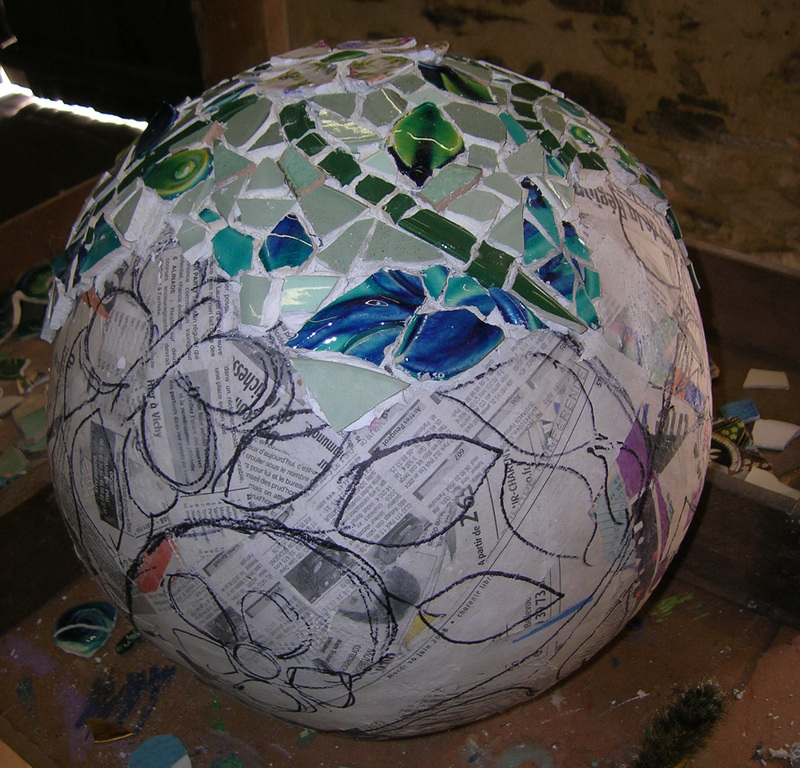 Fourth – Tape off every other “pie wedge” and paint it one of the colors of the mural. Then repeat with the remaining “pie wedges” with a different color of the mural. Thanks to my friend Patricia Newton of Elephants on the wall for this project. If you’re like me you’re passionate about decor and would love to extend that passion that into your children’s bedrooms or babies bedroom or nursery. Imagine what your child’s room could be like if you could continue the decor onto the wall with some kind of decorative walls feature. By the time you finish reading this short article you will begin to realise that you could easily create painted art for your child’s room. My special interest is in the painted wall, and how to paint a wall for your child or baby nursery. 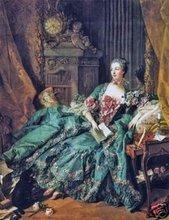 Did you know that some people think they are called ‘wall muriels’ or ‘wall murials’? I think that’s cute, but I don’t mind what you want to call it, I am just interested in helping you to paint a mural yourself with simple wall ‘muriel’ designs. Let me show you how. When you get right down to it you could describe my DIY mural system as a wall template, perhaps even a wall stencil, but guess what? What would you say if I told you that basically it’s good old paint by numbers, but on larger scale? Let me show you how to make a DIY mural design even more special to your child. Picture your child’s favourite theme for a mural, but then imagine what it would be like for him/her to have their name added to that painted mural. When you paint a mural yourself, you have the option of personalising the design with your child’s name. Consider this when planning a wall design for your child. We have a number of paint by number designs that can be personalised. How to easily paint a jungle mural for a jungle themed room. The easy paint by number design make it easy for anyone to paint their child a mural, and at the fraction of the price of hiring a professional mural artist. All of your favorite jungle animals have gathered by the pool watching baby elephant and his mum do their party trick to the delight of the little crocodile taking a ride with his mum. This adorable wall mural is sure to be perfectly delightful in any child’s room. The paint by number Kit includes: pattern, transfer paper, directions & color guide. The results are really professional your friends will be hiring you next! 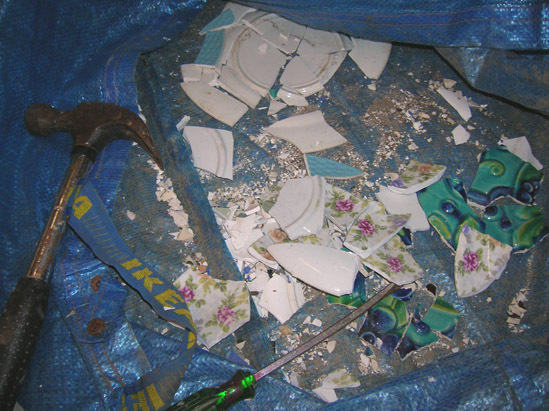 I have been collecting bit of broken plates and pottery and broken it up in a plastic bag into managable sized pieces. You really need to smash it in a bag as otherwise the bits fly all over the place in your general eye direction! I have drawn a rough design on the ball. I bought a tile adhesive that is designed for bathrooms and is waterproof. I’ve got some tile nippers that I can cut up the pieces of pottery into the general shapes I want, but they are not great quality, so the shapes are a bit rough. I don’t mind as I’m a bit too impatient to bother with fiddly little pieces anyway. 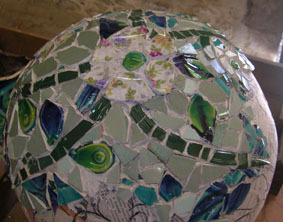 Slowly but surely I have stuck on leaf shapes, a butterfly and dark green stems, and it’s starting to come together. It’s really theraputic, like doing a jigsaw puzzle. 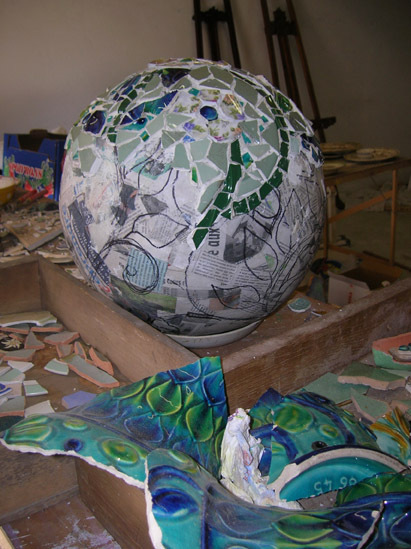 The plates and pottery that I have used are all different thicknesses, so the surface of the mosaic will be uneven. You can see in the picture below how the flower petals stick up. I like that, and I’ll regard that as a deliberate feature! I used a waterproof grey grout which pulls the design together. 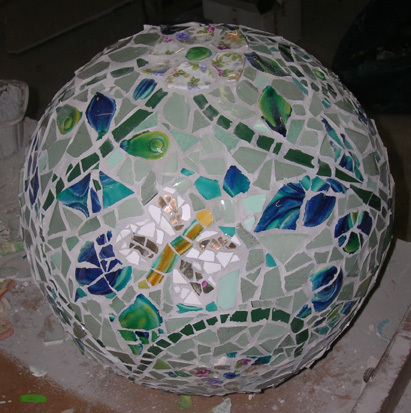 Now it looks like a real mosaic! I still have the other ball to do, and after that I’ll show you the next stage of attaching the balls to the iron bars to make them into topiaries. As you may know, chalkboard paint comes in either green or black. You might not want either of those two colours, so why not make your own colour? Mix together all of the ingredients listed above, blend really well and that’s it. You now have chalkboard paint! You should only mix as much as you will need for your project. It doesn’t keep well, but can be stored in an air tight container for a few hours. After a longer period of time, the paint will begin to thicken a little and become a bit brittle. Apply your paint with a regular paint brush and allow each coat of paint to dry completely, before applying the next. After each coat of paint, gently sand the paint with a 400 grit or higher grit sandpaper and wipe away any dust. This will help keep your painted surface nice and smooth. You also need to condition your chalkboard, once you have finished painting. Be sure your paint is completely dry. Place a piece of chalk on the side and rub over the entire chalkboard surface, covering the entire area with chalk. Using a felt cloth, wipe off the chalk you just applied. With a slightly damp cloth, wipe the chalkboard clean. Now your chalkboard is ready! How do I make larger quantities of this paint? I am sorry to say that I have not ever made larger quantities, as I use this paint for small projects only. It is important that you be aware that tile grout hardens quickly and when mixing with paint, the time span will be longer, before the paint begins to thicken and harden, but it will eventually harden! However, when mixing larger quantities [such as a litre], I would suggest that you mix 1 part glaze to 2 parts paint [as is the small quantity recipe], but reduce the grout significantly. A few heaping tablespoons of grout will most likely suffice. I suggest that you test this first, but I have heard back from others that have tried this method with great success. It’s important that you note… you do this at your own risk. I have not tested this recipe to be used in larger quantities! This is a faux finishing medium available at craft shops in small quantities and larger quantities at paint shops, Home Depot, Wal-Mart and similar retail stores. Most major paint manufacturers carry their own brand of this product and it is readily available. Please be sure to note that this recipe calls for a water based glazing medium and not an oil base. This is important! You can not ever mix waterbase and oilbase products together. Water and oil, simply do not mix! 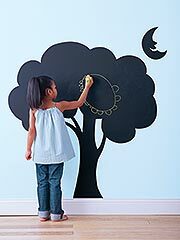 Create a chalkboard in your child’s room and give them a place they where they ARE allowed to draw on the wall! Any shape could become a chalkboard, providing it is simple and bold. This pirate mural combines the mural with the chalkboard area. The paint by number design can be found at the Magic Mural Factory for US buyers or Wallstory Murals for UK buyers. Simply paint the name board section in black chalkboard paint. The pirate mural design is also available as instantly downloadable E-mural from the Magic Mural factory. The design is can be enlarged to any size you wish using an overhead projector. This tiger chalkboard would be a wonderful addition to a jungle themed bedroom. The Magic Mural Factory E-mural page . We found this lovely design at Real Simple. Draw a simple tree shape in chalk. If you make a mistake, simply wipe away your marks and redraw it. When you are happy with the tree shape, simply paint it in with black or green chalkboard paint. The heart and lovebird design above is painted in green chalkboard paint, but you can create your own chalkboard paint in any color you wish using a chalkboard paint recipe which I will supply in my next post.